Full speed ahead toward your bar guarantee. 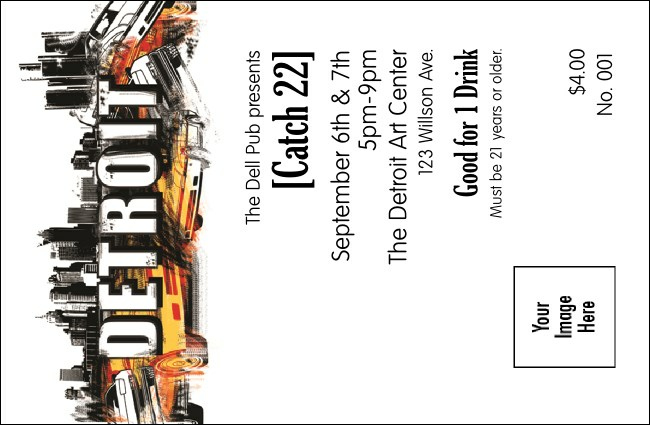 Turbo charge bar sales with a Detroit Drink Ticket. Orange and black tickets with an automotive design puts you in the driver's seat so you can take charge of tabs. Includes space for you to upload your own image so you can add your logo, a sponsor's logo, a head shot, or whatever else gets your motor running. Get your event in gear with local Event Kit printing from TicketPrinting.com.